Kyrenia Hotels With 340 days of sunshine a year and the perfect Mediterranean climate it's no wonder thousands of visitors flock to Cyprus every year to escape the sometimes less forgiving Northern European climate. Northern Cyprus has all of the prerequisites for the perfect summer break: sun…lots of! Beautiful sandy beaches, warm turquoise blue waters to bathe in and a sumptuous mix of the best of Eastern and Western cuisine. And Northern Cyprus is able to offer its many visitors far more than a perfect climate and fine food; one of the highlights of a visit to Northern Cyprus is a trip to the ancient and beautiful harbour town of Kyrenia (or Girne). The town of Kyrenia, or Girne as it's called in Turkish, is the jewel in the North's crown; a fine old harbour town with a beautiful horseshoe shaped harbour which is lined with waterfront restaurants where you'll be able to while away a lazy afternoon watching the fishing and sailing boats going about their business. 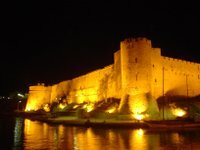 Anyone lucky enough to enjoy a stay in North Cyprus should never miss the opportunity to see Kyrenia harbour at night. Hundreds of candles gently light the waterside restaurants and flicker and dance off the water's edge creating the most perfect ambience in which to dine anywhere in the world. If you're a lover of freshly cooked seafood you'll be spoilt by the huge array of seafood dishes on offer at the specialty fish restaurants which are the pride of Kyrenia's harbour. To the side of the old harbour sits the magnificent Byzantine Kyrenia castle, once used during colonial times as a prison by the British it's now the home of the Kyrenia shipwreck museum which houses one of the oldest trading shipwrecks in the world. The ship sailed the Mediterranean at the time of Alexandra the Great and it sank around 300BC when it was already of quite an age! Many of the objects the ship carried on its voyage over 2300 years ago are now also on display at the shipwreck museum including perfectly preserved almonds which were stored in around 9000 jars held under the sea until the ship was recovered in 1969. The central shopping area of Kyrenia lies just behind the old harbour. It is well preserved and quaint with plenty of twisty narrow streets to explore each with their own unique character and charm. For those who like a bit of retail therapy, be it for gifts to take back to loved ones or for the latest high street fashions, you won't be disappointed. Kyrenia is the perfect shopping location for the savvy shopper where you'll be able to pick up high quality designer clothes for a fraction of the price that they would have cost you back home. If you plan to stay a while in Kyrenia then you'll be pleased to know that accommodation is available to suit all budgets: from simple bed and breakfast to grand 5 star luxury in hotels like The Rocks or The Colony, each able to offer luxury that will satisfy the demands of the most discerning guests. The Colony will take you for a tour of the old town in a beautiful horse drawn carriage and if you prefer a little Hollywood living then a luxury stretched limo can be waiting to take you to a beachside restaurant of your choice. Northern Cyprus is blessed with natural beauty and the charmed and historic old town of Kyrenia is truly the jewel in the crown. There is literally something for everyone to see and do - whether it's to taste the fine seafood, to step back thousands of years in history or to simply relax and watch the world go by in one of the most beautiful locations the Mediterranean has to offer.